NHLBI health information materials are available in a variety of formats through our Online Catalog. This online, hands-on, information-packed toolkit was developed for organizations interested in running community health worker (CHW)-led heart health programs in their communities. 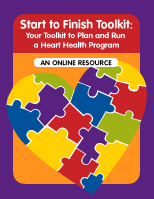 It connects you to the NHLBI’s heart health materials and instructs you how to plan, run, and evaluate a heart health CHW program from start to finish. These printable files will help you learn more about healthy living as well as plan for and accomplish your heart healthy goals. Find out about the risk factors you can and cannot control. Organize the health history of your relatives with this form, and you may get insight on your own health and habits.